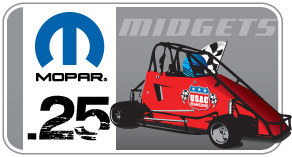 USAC’s newest Mopar .25 Midget club debuts next May in Michigan as the Little Kalamazoo Speedway Quarter Midget Club begins operation at a track located on the grounds of Kalamazoo Speedway. Long a hotbed of open-wheel racing, the Kalamazoo area has hosted several USAC races through the years and this latest venture will form a foundation for future USAC racers from a state already known for producing two-time Indianapolis 500 winner Gordon Johncock (Hastings) plus USAC Champions Brian Tyler (Parma), Doug Kalitta (Ann Arbor) and Sam Sessions (Nashville). The new track is concrete, banked 13 degrees in the turns and seven degrees on the straightaways and will be located just outside turn three of the existing Speedway. It’s goal is to become the biggest and fastest track in the country and a total of 18 race meets are planned in 2011.